The Official Website of Bestselling Author Kaitlyn Davis (Kay Marie): 2018 Here We Come! My Goals For The New Year!! 2018 Here We Come! My Goals For The New Year!! My Top Five Author Resolutions of 2018! 1) Publish Shatter and finish Midnight Ice with a bang! Shatter goes on sale tomorrow!! Woohoo! This series has been SO MUCH FUN to write! I'll be sad to see it go and I will definitely miss these characters, but I'm not saying goodbye to them quite yet :) I could see a spin-off in the future, so I'm not ruling anything out! What's also a little cool is that Shatter will be my fifteenth published full-length book! A little crazy to believe! 2) Finish The Raven & The Dove, my NaNoWriMo Project! Wow, this book is becoming even more than I ever thought it could be! I'm about 60k words into the manuscript, and I think I might reach 90k before I'm done! The longest book ever for me! But the world and the characters just keep growing and spinning and strengthening in my mind, which is the most exciting sort of writing for me! If you haven't heard about it yet, I'm calling it a Tristan & Isolde retelling set in an avian inspired world :) Not sure when it will go on sale, might put it on the back burner for a little while so I have the proper time to edit, so we'll see! In the meantime, you can add it on Goodreads to get all the big updates! 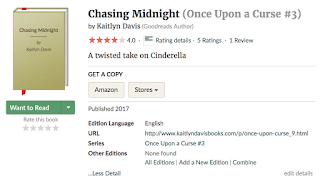 3) Finally write Chasing Midnight, the third book in Once Upon A Curse! A lot of fans seem to want to strangle me for making them wait so long for this book, but 2018 should finally be the year! I got a little sidetracked by new projects I'd been super inspired by, but this book has been creeping into my brain over and over again, so I think the time is finally here to sit down and write it! Chasing Midnight is also on Goodreads if you want to add it :) I'll be posting updates there as they come! 4) Write a new Kay Marie Romance! It's been a while since I've published a new pen name book, and I'm itching to get back in the game :) Contemporary romances are so much fun to write! I have a few ideas percolating, like always, but I haven't decided which one I want to move forward with. So, more details to come soon! But for now, understand that 2018 will be a good year for anyone who liked my Kay Marie books! 5) Explore New Publishing Avenues! I really think diversification is key to a lasting career as an author--trying to new genres, exploring new ideas, taking risks! And in 2018, I'd love to really embrace all the opportunities available. Whether it is looking into publishing something through a traditional house, submitting short stories to an anthology, collaborating with another author on a series, participating in more live events--anything and everything! I just want to make sure I don't close myself in, which is easy to do when you are self-published, and that I get out of my comfort zone a bit! So there we go, my resolutions for 2018! Is there anything you've been waiting for that wasn't on my list? Any ideas you have for me? I absolutely love getting your feedback! Top Five Books on my TBR for 2018! Sophie Kinsella is an auto-buy for me and she has a new book coming out in 2018! Yay!! I adore all of her books, so it doesn't even matter what it's about! This book has been on the NYT Best Seller list ever since it first published, so obviously it's good, but more importantly, it's poignant for the world we live in. I just bought a copy this week and I can't wait to sit down and read it straight through, because I know this is one I won't be able to put down. A few of my friends fell head over heels in love with this book, and I've been aching to read it ever since I heard them gushing! The ebook went on sale this week, so I immediately snagged it! The cover first caught my eye, and the description completely ensnared me! Part murder-mystery, part social-commentary, I can't wait until this one goes on sale so I can grab a copy!